In the midst of all of my other unfinished projects, I stopped last week to make this tote bag. 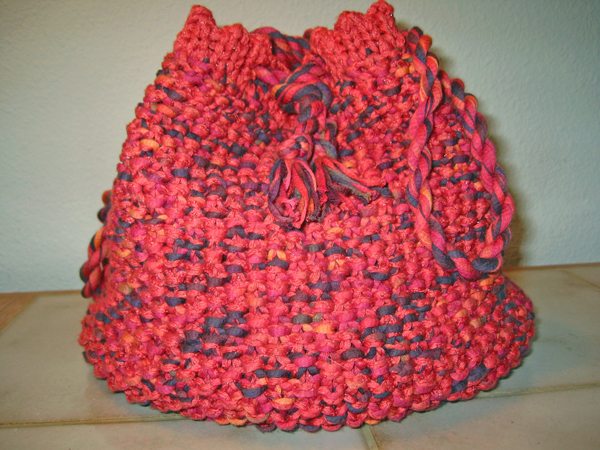 It was inspired by the Trio knit tote bag, a free pattern from Crystal Palace Yarns, but I added my own touches. Instead of an I-cord trim around the top, I added trim with a picot edge. Instead of I-cord handles, I used a monks’ cord drawstring. The tote is knit in seed stitch using one strand of Tahki Yarns Chat Print in color 023, and one strand of GGH Capri in color 03. Chat Print is a cotton tape, and Capri is a chained cotton/modal yarn with a nylon wrap. The trim is a double strand of the Capri. This is the second trim I tried. The first one, a simple stockinette stitch tube, was on the bag when it made its public debut at work and at Thursday Tangle knitting night. I wasn’t very happy with the way that one came out, so I frogged it out and started over with the hemmed, picot-edged trim. After an unfortunate encounter in an elevator, I realized that in order to be most useful the tote needed to be lined to keep knitting needles and other sharp objects from poking through the bag and into other things. But the great thing about having a knit tote is how stretchy it is. You can over-pack it a lot, because it stretches to hold whatever you’re filling it up with. And what’s that we see peaking out of the innards of the tote bag? Why, it’s Clapotis! 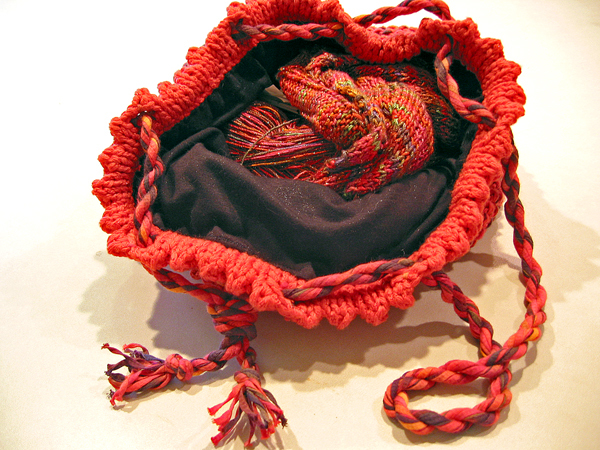 My Clapotis project moved out of one of Tangles cool brown paper bags and into the tote last week. 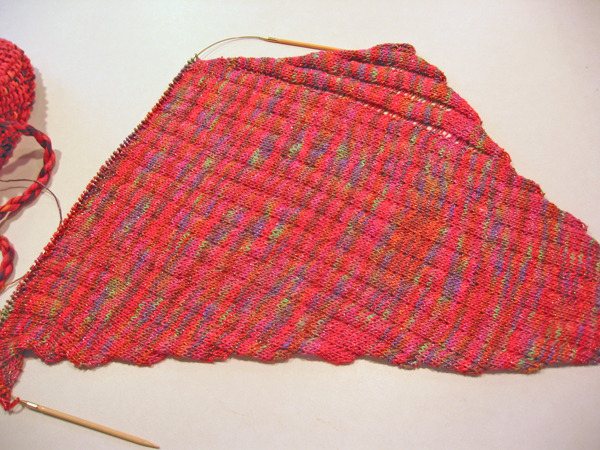 I’ve dropped four stitches on the Clapotis, and I’m just about ready to drop the fifth. If I’d stop wandering off on other projects and focus on this one, I might actually be able to completed it! 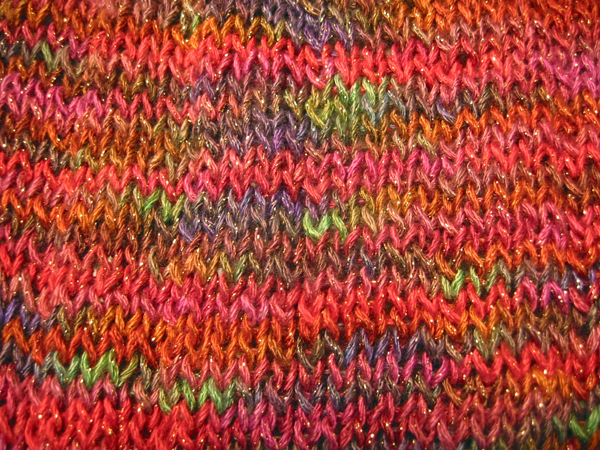 Clapotis is knit from Blue Heron Yarns Rayon/Metallic yarn in the aptly named “Parrot” colorway. The close-up pic shows the colors better. I love this yarn. The drape of the fabric is wonderful and this is going to be very nice to wear. But it’s not inexpensive. I’m not likely to knit with it very often. I was over at Woodland Woolworks yesterday, and I found South West Trading Company Phoenix, a soy-silk ribbon, in Harvest Green and Napa Valley; and Brown Sheep Company Cotton Fleece in Dusty Sage. I think that these two yarns will make an awesome tote bag. I’m going to make the pattern for this one up as I go along. As with socks, it makes more sense to me to start at the bottom and work my way up rather than the other way around. There’s also a twisted I-cord trim I saw on a pair of socks that I’d like to try on this tote, and I want to do an I-cord drawstring rather than monks’ cord. If anyone knows how to do I-cord really fast, I’m all ears! Monks’ cord… It’s funny, but I learned how to twist rope on an OMSI Family Archeology Weekend thingy out in the John Day Fossil Beds that #1 Son and I enrolled in about 8 years ago. It was a fun weekend, and I’d recommend it to any family if OMSI is still doing it. Along with digging for fossils on a field trip to the Fossil, Oregon High School fossil beds, chipping out arrow heads, polishing thunder eggs, hiking and being eaten alive by lots of large, hungry, 6-legged critters, we learned how to twist rope out of dry grass. #1 Son and I made bracelets from our rope and wore them for the rest of that vacation. Who knew that skill would come in so handy, or that I would remember how to do it? It was certainly amusing for the cats, as I stretched ribbon yarn across the kitchen in order to twist it into monks’ cord. Moo Cow wanted to help, but I discouraged it. I have to admit that, since that long-ago weekend, I have never made another arrowhead.